The massive, bright-white Royal Palace (Palacio Real) on the Plaza de Oriente in Madrid dates from 1734, when the 3,000-roomed royal residence was commissioned by Philip V. The imposing palace was built on the site of a Moorish fortress which dated back to the 9th century. 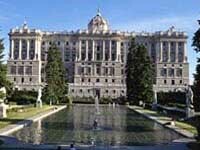 It was last called 'home' by the royal family in 1931 - the present king, Juan Carlos, lives in the more subdued Zarzuela Palace outside Madrid - but is still officially a royal residence and is used for some royal events. Most of the rooms are now open to the public, and others are used for state business. English tours are run regularly, lasting about two hours, taking visitors to the reception room and state apartments, the impressive armoury and the royal pharmacy. The grandiose state apartments are filled with art treasures, antiques and opulent Rococo décor that could even rival Versailles. The palace gardens, in their current reincarnation, date from 1890 and contain a number of sculptures. The palace affords visitors great views over the city and there is plenty to explore in the vast palace complex. Apart from the guided tours, visitors can self-guide with a rented audio guide, or simply purchase a brochure in their language of choice. Admission: €11 (basic fee), concessions available. Guided tours and audio guides available for extra cost.